Planning for NASA’s 2020 Mars rover envisions a basic structure that capitalizes on the design and engineering work done for the NASA rover Curiosity, which landed on Mars in 2012, but with new science instruments selected through competition for accomplishing different science objectives. 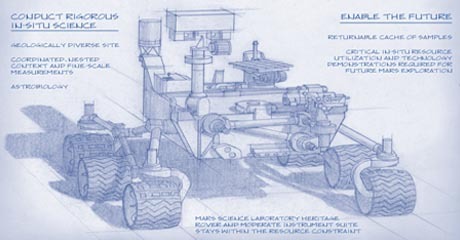 Above is an artist’s conception of the Mars 2020 rover. Mars 2020 is a mission concept that NASA announced in late 2012 to reuse the basic engineering of the Mars Science Laboratory (carried by Curiosity) to send a different rover to Mars, with new objectives and instruments, launching in 2020. THERE’S A GOOD EXPLANATION FOR WHY LIFE MAY EXIST ON MARS.